Great investors buy value, not speculation. DiscoverCI's tools make finding undervalued stocks faster and easier. 7 hours of stock analysis in 10 seconds or less! Neither should you. Stock market success is built on the research and analysis you do before buying a stock. DiscoverCI gives you everything you need for better, faster stock analysis. Whatever you’re looking for, DiscoverCI helps you find it. Screen for stocks meeting your unique investment strategy. 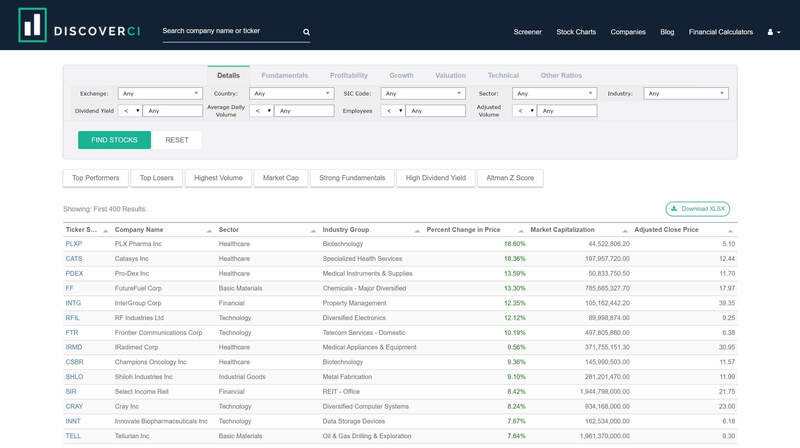 Customize your search with over 100+ KPI’s to find awesome stocks quickly and easily. Filter and export fundamental data to integrate DiscoverCI with your existing analysis tools. Stop searching for the same data and updating the same excel spreadsheets over and over... DiscoverCI offers a better, faster way to analyze stocks. We’ve tried to think of everything, so you don’t have to. Our data, charts, checklists and tools are designed to highlight the key deal makers and breakers right away. Great stocks aren’t always great investments. DiscoverCI helps you find great stocks, that are also priced below their intrinsic value. Our models analyze and calculate an unbiased fair value for over 5,000 stocks. Easily modify inputs to customize and stress test the valuation model. Dive deep into a stock’s historical operating results to know when to buy or when to sell. DiscoverCI analyzes financial statements and calculates over 200+ financial ratios. Identify great stocks, at a great price. Compare market pricing to calculated intrinsic value. Stress test valuation inputs to find your ideal margin of safety. Evaluate a stock’s intrinsic value. We use discounted cash flow models and advanced algorithms to normalize earnings and give you an unbiased picture of a stock’s fair value. Compare company metrics to industry benchmarks and historical results. Identify stocks on the rise and avoid underperforming stocks.